Install fwbuilder package. It is GPLed for Linux based systems. Find the install instructions here. Don't worry, there are rpm and deb available. Once installed, launch the fwbuilder as root user (iptables need root permissions). Choose the fisrt icon which says "Create new firewall". 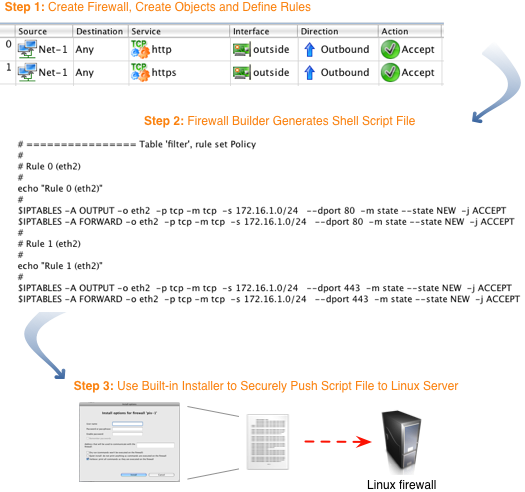 Choose the firewall software as "iptables" and suitable OS. If you are not sure about the options then go for "Linux 2.4/2.6". It is the kernel version. Also give the firewall an appropriate name and click next. Select "Configure Interfaces Manually" and click next. Click on the tiny green "+" sign on the left and add the ip addresses of your interfaces. Name would be the usual Linux names like "eth0". Now click finish. Now click on the green "+" sign to add rules. By default these rules are all restrictive. They'll stop ALL the traffic from your network interface so we need to modify them. The easiest way to do so is to right click on the options. Now install the firewall by clicking the install button next to the compile button. So now you can create firewalls easily. Check out the documentation of fwbuilder if you want more detailed instructions. Thanks for the tip Aditya! I see that you’re using Linux Operating System but our cisco instructor only uses Windows Operating System. I’ll just bookmark your post for my reference when we try to apply this in Linux.